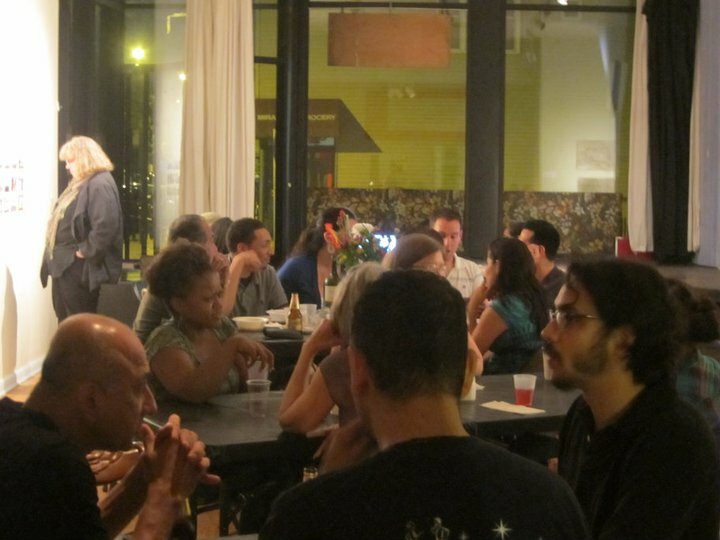 NTS interviews Jose David and Christina Obregón who represent two generations of the Pilsen art space La Casa de Arte y Cultural-Calles y Sueños. 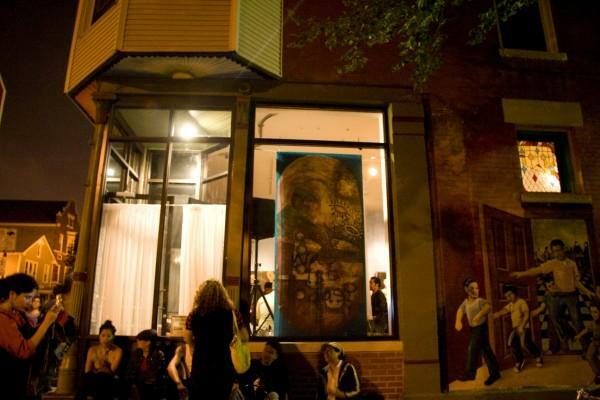 Calles y Sueños represents a unique model in local art history where a space existed in thrived for nearly 10 years (led by Jose David) and then temporarily closed, and was re-opened two years ago by Christina Obregón to continue the project and move it in new directions. 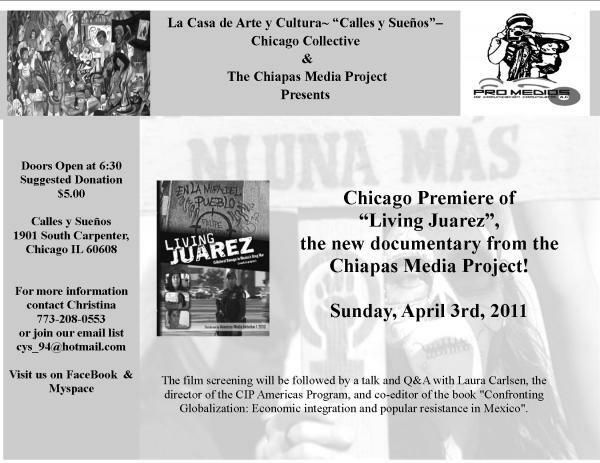 Daniel Tucker (DT): What groups and activities were members of Calles y Sueños involved in before the founding years? Jose David (JD): Before Calles y Sueños, okay. In the early 80s we opened a space on, I believe it was on 22nd and Racine, or 21st and Racine, somewhere in there. It was called Kalpulli, it was not Calles y Sueños. It was a group of people from this community that were opening this space. I knew them and they knew that I organized art events. They asked me if I wanted to work with them and I accepted the invitation. There were two brothers, Miguel Jiménez and Guillermo Jiménez who are both painters, together we came to Kalpulli. We knew in the collective Martha Pedrosa, Jose Uribe and Antonio dos Santos. Okay, so we had the first Day of the Dead show before the Mexican Fine Arts—which is now called the National Museum of Mexican Art. 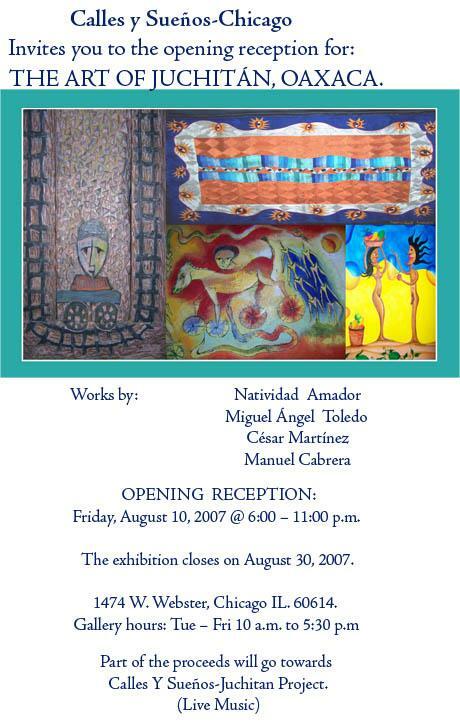 It was the year before the The Mexican Fine Arts opened. It was was organized by a Chicano artist by the name of José Gamaliel González and he was the one that invited all of the artists to participate in that show for the Day of the Dead, which was the first Day of the Dead show in Chicago. He invited me, Carlos Cortez, Miguel and Guillermo and I don’t know who else. But there were many artists from this Pilsen community. It was a big thing. 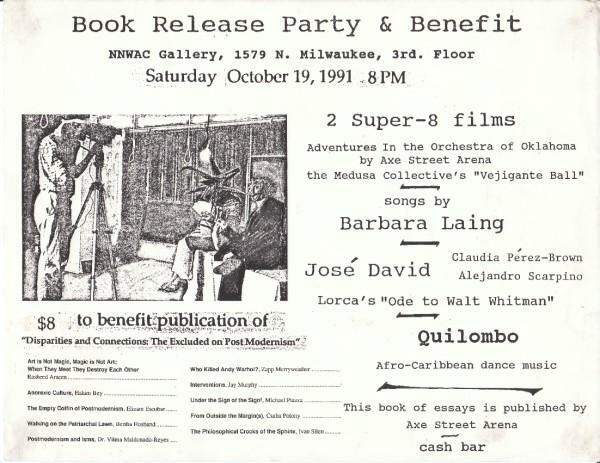 Then the same year at the same time the Axe Street Arena in Logan Square was having a show which was called Art As An Act of Liberation. That’s what it was called. I went to see the show, and I was really impressed by the artwork of Elizam Escobar. I had never seen his work. I knew he was a Puerto Rican political prisoner. We asked the people from Axe Street Arena, Bertha Husban and Michael Piazza if we could have that show come to our new Kalpulli gallery that we had in Pilsen. We had that show there in December after the Day of the Dead show that was on November 2nd. That was when Elizam Escobar became known to the artists in Pilsen, because we had his show there. Doing this show with Axe Street Arena established a relationship with them. Miguel and Guillermo Jiménez decided that the Kalpulli was not really the place where we wanted to be. I’m not going to go into the details, but we just pulled out and we started working with Axe Street Arena because we were always invited to do shows there. We were in agreement with what their proposal was. They were saying that culture is not separate from politics and that was why we went there. At that time they were doing a lot of solidarity work with the people of Central America, because that’s when the war in Central American was happening in particular El Salvador, Nicaragua, and Guatemala. They were doing a lot of solidarity work with the people of Guatemala. But then Axe Street Arena closed, which I believe they closed in 1985, but I’m not sure. And so after they closed we were left out, saying “Well, what do we do now?’ we didn’t want to become a not-for-profit, we didn’t want the 501C3. We knew that by becoming a not-for-profit, there was the danger of being co-opted, which a lot of good things have gone down that way and so that was a dilemma, because we said, ‘well, we don’t have any money.’ So how are we going to do it? So what we did was we organized like nomads. We organized events in the places or venues that would allow us to do events. One was on the second floor of the Flat Iron Building, the Near Northwest Arts Council. Others were San Pius, Prospectus, and the APO. We did some shows at the Hot House, when it was on Milwaukee and Damen. And we invited some visual artists to come and participate in this event that we were doing in solidarity with Cuba. And things like that. We were not disconnected with the social and political struggles, and also cultural identity. You know, they’re all combined. We tried to combine everything. The idea that we had and that I still have—it hasn’t changed—is to expose the Latin Americans who come here, or the ones that were born here, to know about their culture, about their artists, their poets, their painters, their musicians. So this is what we did. 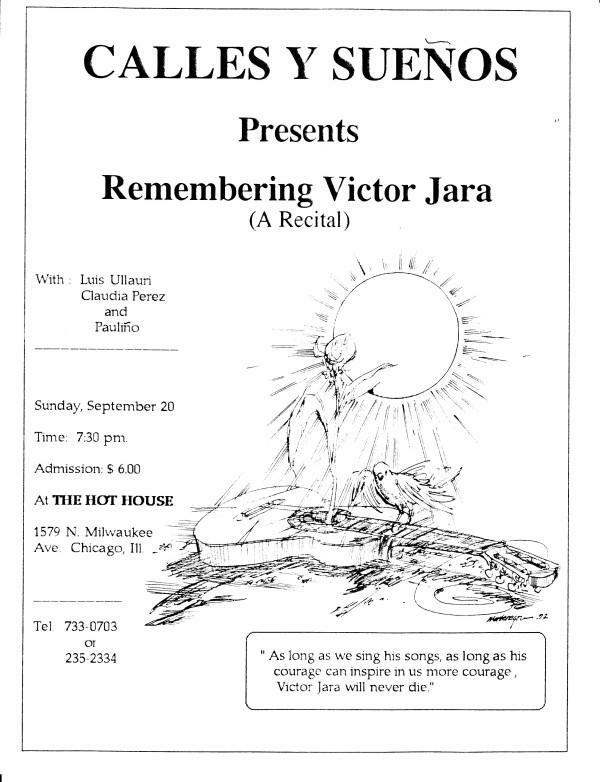 At that time we did a homage “Remembering Violeta Parra.” And that was to present these artists who had been struggling, like Violeta Parra a well-known artist who struggled in life. She went to Paris, then she went back to Chile. She is also the godmother of what became known, the Latin American New Song. And what is the New Song? Well the New Song is like songs of resistance. She influenced all that emerged right after her death. She was the poet of Chile. You know about Neruda, you know about Lorca, you don’t know about Violeta Parra. And then we would organize many other events. We would show a movie, Latin American films that are not shown here. Well now they are more popular, but we’re talking 1985. The Latin Americans didn’t have the presence that they have now. But at that time we were like pioneering this, you know? So that’s what we were doing. And then we were also working with young people here that were doing music, or doing paintings, and we would organize a show where they would participate. Okay, then Miguel and I started thinking about, ‘Well, you know, we need a place.” Because it’s kind of hard to be hauling sound equipment, stage, chairs. It was hectic. You had to have the heart and the love. If you don’t have no love it won’t happen. Because you know there was no money. The school of thought that is common in the United States is capitalist and individualistic, “what am I going to get out of it?” Our school of thought is different. We don’t think about those things. We do things because they’re things that are necessary. We feel like this is what I want to do. It’s not because I’m being paid. And that’s what a lot of people really didn’t understand. A lot of people say, ‘well, how do you survive?’ And I would just say by faith. And they’ll say, ‘what does that mean?’ They cannot understand. Volunteer work is not something that you do. We made this a self-supporting, self-covering project. You have to look for the resources, materials and human resources to develop projects like that. It’s very difficult, because people are not used to that. I more or less was self-employed, and so I could manage the time and I would dedicate my time. I give my heart and soul and body to what I’m doing. Because that’s what I want to do. I don’t want to do anything else. When we decided to look for a space I was living on 17th Place and Halsted. One morning I woke up, it was spring time and I saw next to the building where I lived that there was an empty lot. And so the light came into my head. I said, ‘well, I think we should do it there.’ So I called Miguel and some other people and I said, ‘look, we’re going to open it here.’ And they said, ‘where?’ And I said ‘here.’ So we start fixing, there was a lot of grass, and we start fixing it up. I called a lot of artists to participate in the show. There were musicians, poets, painters who came and they just brought the artwork, and we hung the artwork from the fences, from the trees and we improvised a stage. There was dancing. And that’s how Calles y Sueños began, in 1989. You could say we had our space. It was at 17th Place and Halsted. That’s where the whole thing started. We were there four years, until ‘93. The place became very popular because people knew that we were very serious about it, or we were concerned about what’s going on in the world, particularly in our own countries where we came from, like Central America. 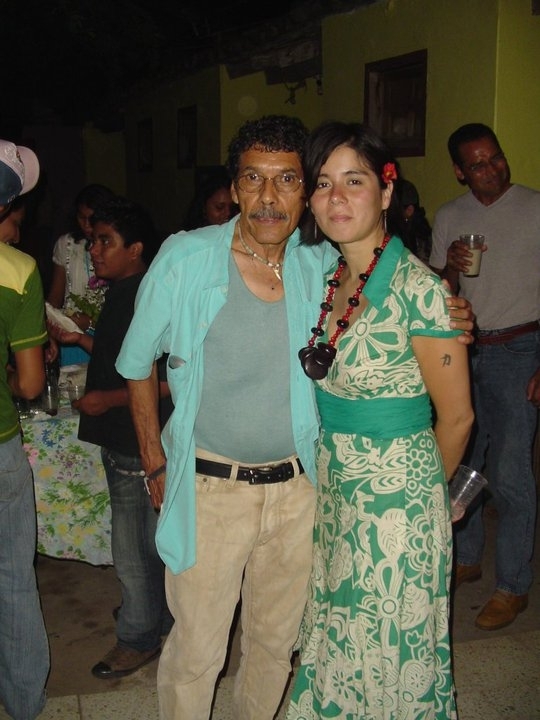 The people that make Calles y Sueños at that time, they were Carmen Aguilar, she’s from Peru. Claudia Perez, she was from Chile. Lito Barraza, Ramon Marino, he’s Mexican. I’m just trying to think about some of them. And so we were doing a lot of solidarity work with the struggles throughout Latin America, whether it was to denounce the atrocities of the dictatorships in Chile, in Argentina, in Brazil, the war in Central America, the blockade of Cuba, and also our struggles here in the United States, the and struggles for civil rights and so on and so forth. And at the time was the fall of the Soviet Union. That affected—people don’t think that way, but the fall of the Soviet Union, the fall of the socialist camp, that affected the Left. And so, it was just ‘what do we do now,’ you know? This is 1989. DT: And so where there exhibitions or live performance things from that period that kind of stand out to you as being these really meaningful combinations of art practices and the politics of that time? 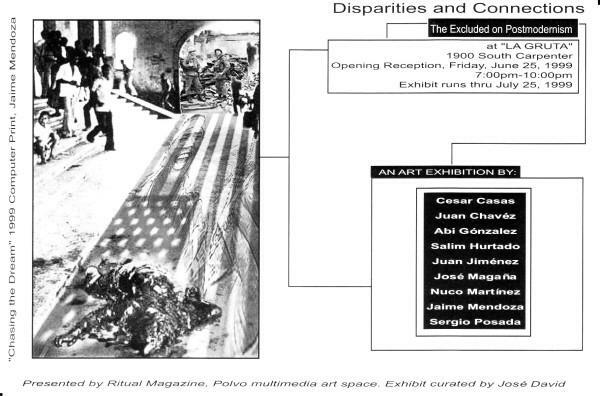 JD: We wanted to do another bigger exhibit with Elizam Escobar and so we submitted a proposal to the Cultural Center, the Mexican Fine Arts Center Museum, and the Art Institute. All of them refused it. Because he was a political prisoner, or a prisoner of war. So they said no, we can’t do this because they’re going to cut the funding, and …this was the advantage that we had. Because nobody is going to cut the funds, because we don’t have funds, you know? So you see what I mean? That is that freedom. 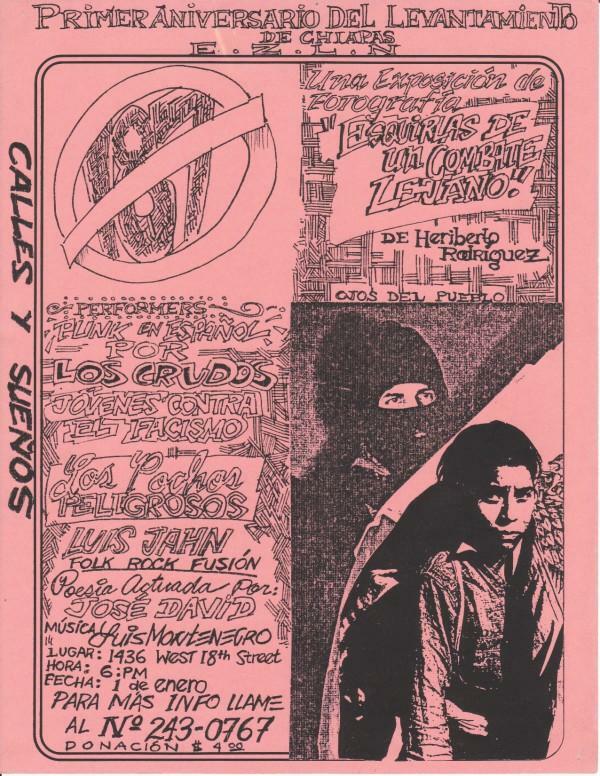 Most of the events that Calles y Sueños does have been connected to politics, progressive politics. But we always were very carful with the quality with the art. We were very careful about that. Because you know I have all these problems with the political Left. They don’t care too much about art. And I tried to show them and we proved them that art plays a very important role in terms of making people aware of a lot of things. My political awareness comes from art, because I read a novel, because I saw a painting, I read poetry. It wasn’t because of political discourse. They’re very difficult or me to read, you know? They’re very dry. I’m not saying that they’re not great, don’t get me wrong. Art deals with all the issues of human, like anguish, fear, death, life. DT: You talked about bringing Elizam Escobar’s work from Axe Street Arena to Pilsen. Why was it that you felt you needed to connect these communities? JD: I come from the whole Civil Rights struggles in the late 60s, early 70s, where there was a connection and a close relationship between the Puerto Rican community and the Mexican community. You know, they have established relations. Unfortunately, a lot of the murals that were created at that time had vanished, but in those murals you could see—you could see the Puerto Ricans and the Mexicans together. I don’t know if they are in books, I don’t know if anybody recorded the history, I don’t know. But that’s how it was. And at that time, that when the anti-war movement had really vanished, and the Civil Rights movement, a lot of the conversations had been co-opted, or some of the leaders have been corrupted and they became mainstream politicians. And so there was a backlash, I think that’s what it’s called. A backlash where they become very ethnocentric, but this is promoted by mistake. So there’s the division, the Puerto Ricans and the Mexicans. So by bringing in—we tried to address that. There were a lot of shows by Elizam Escobar. It wasn’t just Escobar. We also had a poet who was a political poet by the name of Iván Silen who would come here and do his poetry readings. He’s in Puerto Rico now, but at that time he was living in New York and he would come here. And also, we would have Puerto Rican musical group perform here, or we would show a series of films and documentaries around the Puerto Rican independence movement. We did have a Puerto Rican film festival here for two weeks. So that was a way to bring it. DT: So you moved from doing programming in the lot of 17th to this building right? JD: After four years, as I said, we grew. And people said, ‘well why don’t you look for a space? That way you could do events in the winter.’ Because at 17th Place and Halsted we were only doing, something it was like three events. So we did move there, and we found this place, we found some money. Because already people started believing in us. And so we would have some painters come and help us financially. And then we would have more human resources. We needed carpenters, we needed electricians, construction workers, all kinds of community people to do, you know, put in the lines, put in the fence, painting, knocking a wall down. So you needed all that. So all those people came. DT: And what year was that that you moved in here? JD: 1994 we moved here, if I’m not mistaken. Yeah. Christina Obregón (CO): You did the event at the APO for the Zapatistas and then you came here? JD: 1994 we came here. DT: And then it stayed open until 1999, is that right? JD: Yeah, 1999. We closed ten years after starting. DT: And did you, in that process of moving here, did you purchase this building? JD: No. I never want to have property. DT: I was just curious since when you re-opened you came back at the same place. JD: No, no, we always rent this. DT: At that point, was there a base of people that were interested in keeping it going, or that came later, I guess? JD: Well there were a lot of people that wanted to keep it, but they just didn’t know how. Because the problem was in order to do this you had to have, as I say, your heart and mind into the work, because remember there is no money coming from no institution. So there is never budget. There was never a budget. The budget was, let’s say we’re going to do something. Okay, we need this, we need that. And that’s it. And it was fine because I said, okay, we’re going to have an event, so I’m going to work these two weeks, and then the other two weeks I’m going to keep it open so I can do what needs to be done. I had to put the matting, I had to put the glass, I had to put the structure by myself. And every now and then somebody would come and [garbled] half-hour help. But it’s okay, but I’m fine. It’s because it’s my passion. If you don’t have passion you won’t work. It’s my passion it’s what I want to do. DT: Were Miguel and Guillermo still involved at that stage? It worked, and I went with good artists in Chicago, very, very good. In particular Bertha Husband, Michael Piazza, Mirtes Zwierzynski she’s Brazilian, Bertha Husband she’s from Scotland, Rebecca Wolfram she’s from Oregon. Ivan Silén did an art show here, because Ivan is known as a poet, not as a painter. But he did some paintings, he did two shows here. And Ivan is Puerto Rican poet , he’s a very important figure, he’s one of the contemporary poets, you know? So we were working with very good avant-garde artists, because that’s what we were looking. We were not looking for soft kind of things. We would party downstairs, but up here in the gallery people had to show respect. We would have punk musicians here. Like a legendary band, a Latino band Los Crudos this was their home here. They would practice downstairs. They did like two or three shows here. But I told them, I said, ‘okay, motherfuckers’—thats language I had to use with them. They would spit at a show, and things like that. I said, ‘that’s fine. They can come here and perform.’ And I arranged the place, and an art show was up. I said, ‘I’m not bringing the show down. The only thing is that you respect the show. Don’t touch the paintings, you don’t destroy the paintings because this is not financed by the state. And you guys are supposed to be struggling for a better world. I mean, that’s what you claim. I don’t know if that’s true, but that’s what you say. So just respect that, and if you want to slam, just go up and down.’ They were good, because they would make a circle, like all around there, and then the slammers were in the center so that way they would not touch the wall. They did respect that. I did not allow them to go and drink outside. And the way it shows that it was this has been a place that was not limited to this or to that. No, we were not conservative in that sense. 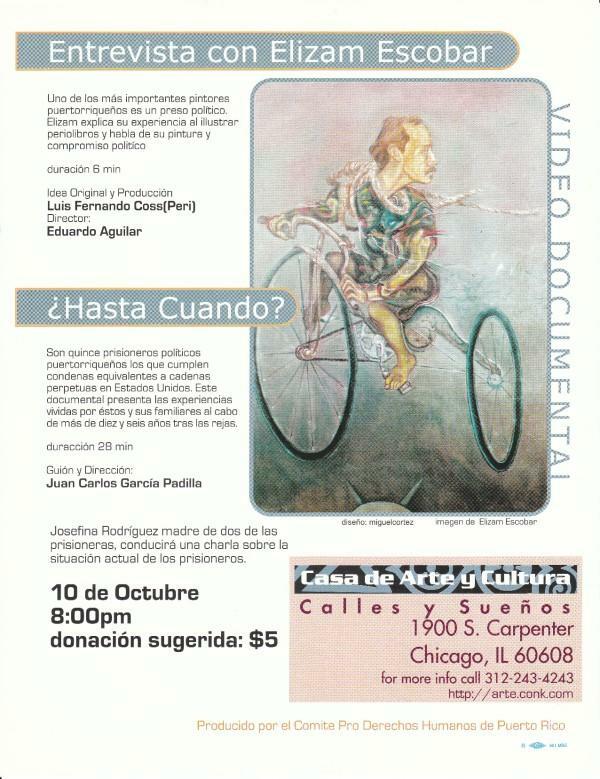 DT: And then after closing in Chicago ’99 when did the Calles y Sueños project open in Juchitan? JD: What happened. Ah, it didn’t open right away. I just went there and lived there. What I did then was I would go to Mexico and stay there in the Winter, and then I would come back to Chicago in the summer. I had a job with the Hot House, so every time I came back to Chicago, my job was there, because Marguerite Horberg, the executive director of the Hot House and I, you know, I always helped her. And so that was a way of helping me so I didn’t have to be looking for a job when I came back. No, if I came here on Wednesday, and Thursday I was working at the Hot House, and I was always working part-time. And so I was organizing events then, even when this place was closed I would organize events. We were organizing other venues, sometimes restaurants…I did a couple shows at the Hot House, art shows, because they had a gallery. I was in charge of the gallery at the Hot House. So Calles y Sueños was always active, even when it was closed, after this place was closed in ‘99. But the project in Juchitan started like about four years ago. First I had to know the area, get to know people. And that took a long time, for the fact that I was just staying there just six months at a time. I would do things like show films with a group of people, or organize—even in my own apartment I would organize a show and things like that and I was doing here in Chicago. And I met a group of people that were doing cultural work, it’s called Culturarte. And so I allied with them and we merged together, and we started Calles y Sueños project there. The same programs that I did over there, are the same that I do here in Chicago. It’s the same focus. It’s the same proposal. That’s the idea that art plays a very important role in bringing lots of people together. DT: How did you connect with Christina, who eventually would re-open the space? DT: Christina, can you talk some about the decision to re-open the space. When was that? CO: That was two years ago in 2009. DT: Because it had been being rented as something else? CO: Yeah, it was rented by an artist who was using it as a studio, and then some other people had been living here. And it was close to ten years that it had been closed as Calles y Sueños. So people met. And then when Jose David came, we sat down and we thought about what could possibly work. He brought Miguel Jiménez into the picture, back again, to be the overseer of Calles y Sueños, because it’s a new time and everything was in transition. Not just the space, but even the way it was structured. Because we all have full-time jobs, so there was a big difference compared to when Jose David opened the space and was self-employed. When we were re-opening the space everybody had their full-time jobs, so we really needed to work out some type of a plan on how that was going to work. And at least from my viewpoint, was that I had my own vision and my own mission of what I wanted Calles y Sueños to be, but it was very strongly influenced through Jose David. But I know that I’m living in a different time and a different moment. And there are some similarities, but that some things I needed to analyze, and I’m still analyzing what is the future going to look like, what is the vision going to continue to look like. And it’s developing. DT: Was there an event or something about that moment, besides the fact that it came for rent again, that you feel made it make sense to or made you want to re-start Calles y Sueños? And it was the same thing as what Jose David was describing earlier, in terms of motivation and heart. I was like, ‘we don’t have any money. We don’t have anything, you know.’ And Marco was actually the person who’s like, ‘I don’t know how we would do it.’ So he was more skeptical. But I was like, ‘let’s just try it.’ So Jose David came, Miguel came and then there was a collective that was formed. It was six members, and we reopened, and the collective was around for about a year and a half. But like Jose David had mentioned, and I really believe in this: if you don’t have your heart, soul and your mind into it, and if you don’t love it, the project, or are passionate about it, is not going to work. You really have to give a lot to the project. One of my challenges right now is that I have a full-time job. And so I’ve been fortunate enough to have friends that are helping me out. But I know that—and I’m going through my own personal transition to keep this space open, which is shifting my own personal career to keep this space open. And there’s no more collective. So now it’s me. CO: As the coordinator. So I’m the program coordinator for the space in Chicago, and Jose David is the coordinator and founder of Calles y Sueños. So I guess the only collective members are myself and Jose David. But we do have people that come and help out. I’m looking into doing internships. I have a friend who’s my business consultant, which are things that we’ve never done before. But again, it’s a different time, it’s a different culture that I’m growing up in compared to Jose David. And so it really requires more business management to plan what this is going to look like. In order for it to survive, and the best advice that people have told me is that you need to get help. You need to really—in order for it to survive, it requires looking for bigger resources. DT: Are there spaces that, in the ten year gap of this space existing, that you were interacting with in Chicago that you thought were keeping either your interest or were sort of doing similar things in a similar spirit? CO: For me the closest to it was probably the Mexico Solidarity Network, and the Chiapas Media Project, plus I also did an internship with the Mexico Solidarity Network, so that whole concept of looking at things politically I learned through them. DT: Are there events that have happened here in the new space since it reopened that you really kind of thought like, this is exactly why this needs to exist? Whether it’s like an event or even just an experience like someone wandering in off the street or something like that? CO: I think it’s been, for me, it needs to exists because I just… what else is there? I’m not going to say I don’t know anything else that’s out there, but I’ve never ever experienced anything close to my own personal vision and my own personal idea of the world that I want, for a social-justice world, a just world. The only thing that has ever been that kind of world has been all the experiences I’ve had in Calles y Sueños. Whether they were challenges or not challenges, whether they were like the best events, they’ve always shown me lessons of what world I could possibly create. DT: Are the things from those early years, like when you were coming up and getting introduced to it, that really were those kind of transformative experiences that you remember. a game of hide and seek with my being. to achieve the kiss of new trails. JD: But that’s the idea, and what she’s saying is good, because that was the idea behind Calles y Sueños. It was to expose these young people to the avant-garde artists that had been in Latin America. Julia de Burgos was a good example, as she said. Because she didn’t know who she was. And so that was the idea. That’s still is the idea. To expose people to these hidden treasures that we had that it’s not accessible to them, whether it’s movies, whether it’s poetry, whatever. Another example that I could give you is Miguel Cortez. When I met Miguel Cortez he was going to the Art Institute. So he came into contact with us, and I started exposing him, in particular, to the Mexican artists. Because he was familiar with European art and European avant-garde too. But not of his own. I said, look,’ you have to know who these guys are.’ So I exposed him to the avant-garde of Latin America like, José Carlos Mariátegui. Mexican muralists, you know. Frida wasn’t as known at that time. Now it’s a big, you know, big because the bourgeoisie converted it into this, you know, object, you know you buy Frida lampposts or whatever. DT: And Polvo, the space that Miguel ended up co-organizing for a long time, was the first place that I ever saw Elizam Escobar’s work soon after I moved to Chicago ….I think that’s really cool that Axe Street Arena was showing his work in the 80s, and you were showing the work in the 90s, and then Polvo is showing the work in the early 2000s. And then last year there was an Elizam Escobar show at the Institute for Puerto Rican Arts and Culture…So even though he was incarcerated for much of that time, he is kind of a locally important artist and it’s kind of an interesting local art history, right? These, you know, who were the different spaces that supported his work over the course of that time period. You know, it’s a really interesting sort of story, right? JD: Nobody wanted to touch Elizam Escobar’s work so we had to do it, and it was his home. In between shows of his work people were always, ‘when is the next one going to be?’ Every two years we would have one. The people, there were a lot of expectations about his stuff because he was he was good. DT: I really like the language of your mission and value statements … they’re just very thoughtful. And I guess I was wondering where did that come from? Is that from the early days of Calles y Sueños, is some of that new? CO: So that was written from the collective, and Jose David was also here for that. Remember when we did the core values and the core beliefs. So that was, Miguel Jiménez, who a big supporter in the 1993-99 phase, and then Marco Camacho, Marcela Gallo and myself, who where the three that grew up with that, and then Arturo Galan and Carlos Bueno were the two newer ones. So there was really a diversity of individuals that helped put all that together: the core values, the core beliefs, and also the mission and the vision. So we did a little bit of, from the past, from the very beginning to those who’ve grown up to the newer ones that were getting involved with the work. DT: And there are several mentions in those documents about kind of the sort of necessity of having revolutionary ideology, but then I’m wondering kind of like are there sort of specific politics that are those revolutionary politics that Calles y Sueños is going to utilize? CO: Well, I don’t support any political party at all. I know my politics very influenced by the left, but what I believe it’s about educating people about something else that can be possible. That it doesn’t have to be the current economic culture that we’re going through, but there is another possibility. I’m not sure what that answer is, but I know what it can look like, what I would want a just world to look like, and all these issues of homelessness and racism, just all the –isms that we’re dealing with. Yeah, it’s influenced from a very leftist, from what I’ve read, but I don’t have any formal education, like I don’t even have any degree. I’ve gone to the university. I’ve tried to go into the whole institutionalized education, but I feel the more I indulge in it the more oppressed I feel. And so I’ve like broken out of that, and everything I’ve learned is through art and culture. Exactly what Jose David has said. I didn’t know what was going on in Puerto Rico and he introduced me to Elizam Escobar If there’s any other artist, that’s how I learn. I went to Spain and I traveled and I went to Chiapas to visit the Zapatistas with delegations and gone on speaking tours and I’ve seen what it possible. I don’t know how to say it politically, but I know that that’s… you know? In our current culture here in the United States and most other countries around the world, you have these elections and people go out and vote. To me that’s not the answer. It’s bigger, and yet simpler. It’s giving power to people who are working, working-class people who work the land. Very communal. That’s just how I see it. You work, you’re in it. If you don’t, then sorry this is not a place for you. And that’s part of my own personal vision for this space. This is not my space, I’m a coordinator. This does not belong to me. This space belongs to the community. And the only way it’s going to stay open is if the community comes and takes care of it. Figure out the rent some other way, I’ll figure it out. And I’ll make it happen, because I’ve got good people, I know good people who believe in it, right, but it’s up to the community to show solidarity and that’s what’s going to keep it open for whatever time it’s going to be open. DT: Well I’m excited about it. CO: Thanks. Yeah, it’s a lot of work. DT: Yeah, no I know. CO: But it’s worth it, it’s so worth it. I think it is. DT: And the history is very rich too, and that’s not something to let go of. Think about how many spaces have come and go and it’s so often that people want to start something but don’t do any thinking about what similar projects beforehand. So I think it’s symbolically really powerful that Calles y Sueños existed before. It kind of floated for a while and then it came back to the ground. JD: It was floating, that’s exactly what it was. DT: And I think that that’s symbolically really powerful for people to see. You don’t always have to start some new space. What if you re-started a space?